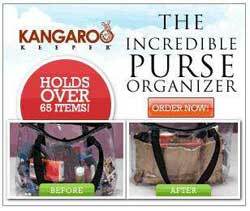 Disorganized purses is now a thing of the past with the amazing Kangaroo Keeper. It allows you to instantly organized any bag. The Kangaroo Keeper is an incredible bag insert that holds us to 70 items. It will transform even the most cluttered handbags into an organized one. It has a place for almost anything so you can easily find what you need. You won’t have to worry digging for your keys or missing a phone call again because you can’t find your phone. Changing purses takes forever if you have a lot things but with the Kangaroo Keeper switching bags is a breeze. The specially designed slots of the Kangaroo Keeper makes it easy to find your phone, makeup, glasses, coupons and cards. There’s even a slot for your beverages and an umbrella. The center slot is for perfect for wallets and larger items. Plus the Kangaroo Keeper is also reversible. This allows to switch the pockets to the outside so you’ll have more room on the inside.